Raman Uppal, PhD, is Professor of Finance at Edhec Business School. 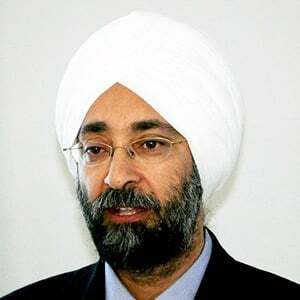 He holds a bachelors degree in Economics (Honors) from St. Stephen's College, Delhi University, and M.A., M.B.A and Ph.D. degrees from The Wharton School of the University of Pennsylvania. Prior to working at Edhec Business School, he was at London Business School and the University of British Columbia. He has held visiting positions at Catholic University (Leuven), the MIT Sloan School of Management, and the London School of Economics and Political Science. His research focuses on optimal portfolio selection and asset allocation in dynamic environments, valuation of securities in capital markets, risk management, and exchange rates. This research has been published in The Journal of Finance, The Review of Financial Studies, Journal of Economic Theory, Journal of Financial and Quantitative Analysis, Journal of International Money and Finance, and Management Science. He is currently an editor of The Review of Asset Pricing Studies and an associate editor of The Critical Finance Review. In the past, he has served as an editor of the The Review of Financial Studies and the Review of Finance, and as an associate editor of Management Science. With Piet Sercu, he is the author of the textbook, ''International Financial Markets and the Firm,'' (1995, South-Western Publishing) and of the research monograph, ''Exchange Rate Volatility, Trade and Capital Flows under Alternative Exchange Rate Regimes,'' (2000, Cambridge University Press), which received the Sanwa Monograph Award from New York University. He has taught courses on Portfolio Choice and Asset Pricing, International Financial Markets, Multinational Financial Management, Risk Management, and Corporate Finance to students in undergraduate, masters, doctoral and executive programs. He is the recipient of the Dean's Advisory Board's Outstanding Teaching Award for 1988 at The Wharton School, the Teaching Excellence Award for undergraduate teaching in 2000 at the Sauder School of Business at The University of British Columbia, the General Excellence Teaching Award for 2001/2002 at London Business School, the inaugural Excellence in Teaching Award in 2008 at London Business School, the Prize for Pedagogical Excellence at Edhec Business School in 2015, and numerous other prizes for his teaching and research.